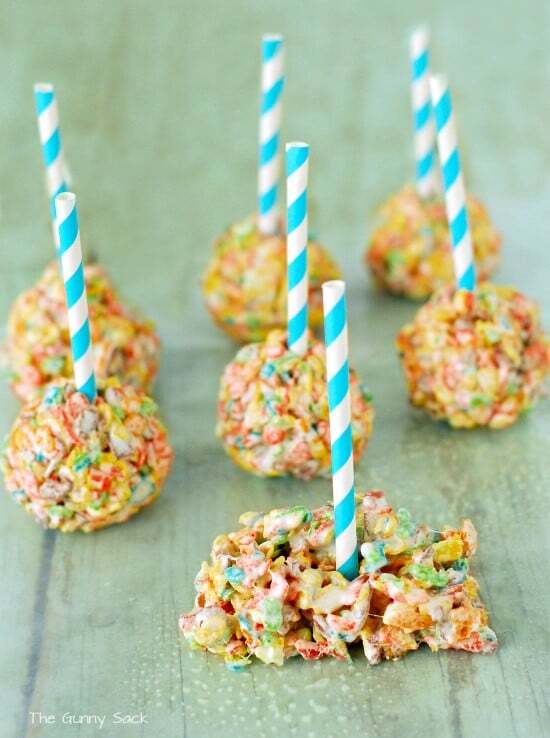 Use Fruity Pebbles to make Rice Krispies Treats. Form the Fruity Pebbles Treats into Fruity Pebbles Pops and dip into CandiQuik which was so graciously sent to me by the local company Log House Foods. My nephew turned 2 years old and we were invited to his birthday party. His things he loves most are trucks. They can be any size, shape or form from monster trucks to construction trucks. While he was on an extended vacation earlier this summer, my kids were Skyping with their cousin and my 2 year old nephew hopped up onto the couch. He was very confused about what the whole computer thing meant so my kids grabbed a big monster truck from our toy box to show him. Boy did that grab his attention and not in a good way. He got very upset saying, “TRUCK! MY TRUCK!” and reaching toward the computer screen. When he wasn’t able to reach the truck, the tears came. His older brother quickly explained to him that it wasn’t his truck and pointed out one of his own trucks and he jumped down to get it…crisis averted! So, needless to say we gave him trucks for his second birthday gift! Besides bringing a gift, I wanted to bring a sweet treat to share. I found some Fruity Pebbles in the cupboard and decided to make Rice Krispie Bars using Fruity Pebbles instead of Rice Krispies. Have you ever made them this way? They smell amazing! 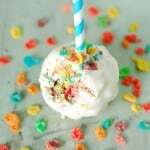 I decided to use some of the Fruity Pebbles Treats to make Fruity Pebbles Pops. 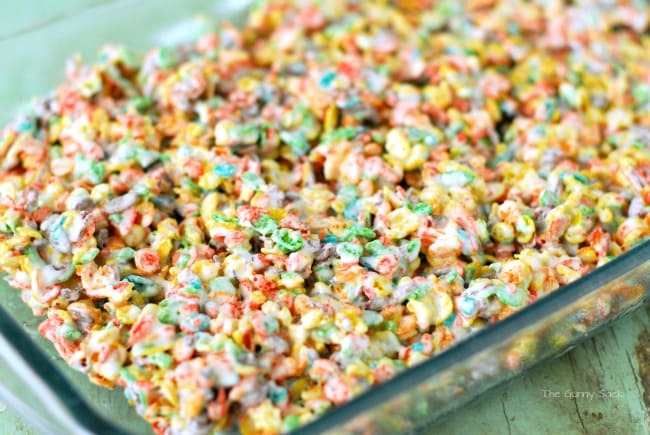 I made the Fruity Pebbles Treats using the Rice Krispies Treats recipe that is on the Jef-Puffed Marshmallows bag. If you don’t already have the recipe you can find it here: Original Rice Krispies Treats Recipe. After allowing the Fruity Pebbles Treats to set, cut them into bars. Cut paper straws in half and form the treats around the straws in a ball shape. Melt a tray of vanilla CandiQuik candy coating. 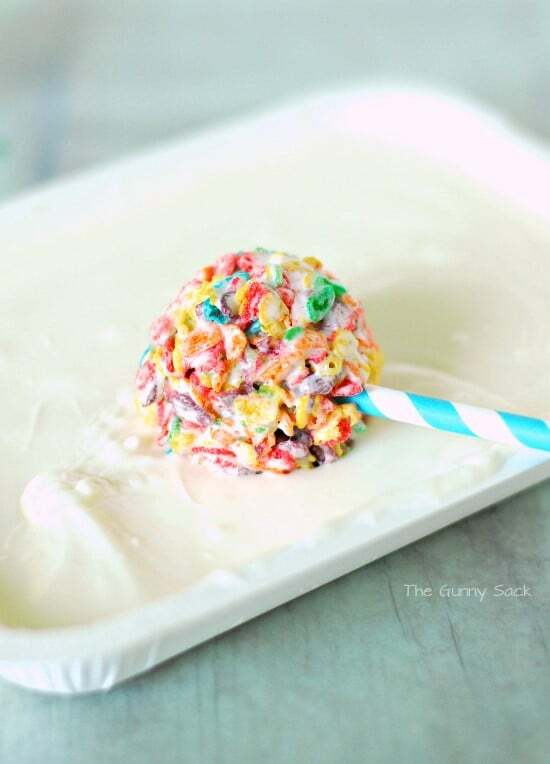 Dip Fruity Pebbles Pops into the CandiQuik and place on waxed paper to harden. 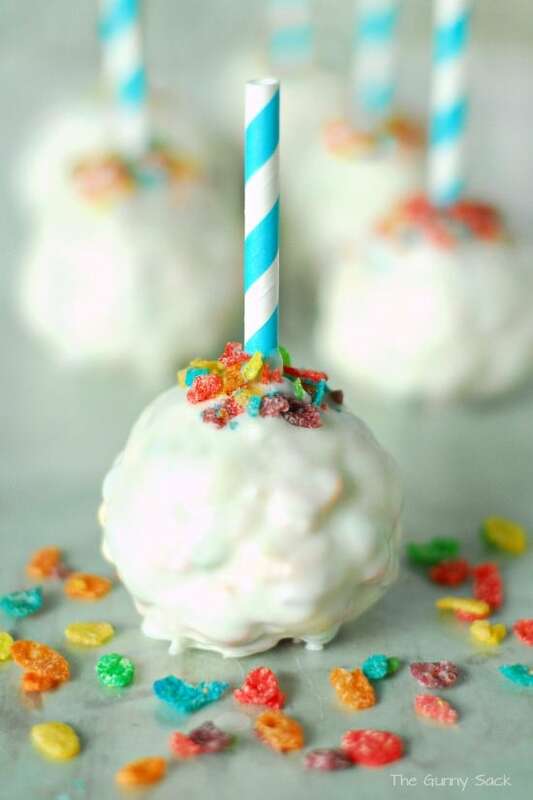 Sprinkle top with crushed Fruity Pebbles to add a pop of color. Allow the candy coating to harden and then enjoy! After allowing the Fruity Pebbles Treats to set cut them into bars. Cut paper straws in half and form the treats around the straws in a ball shape. Melt a tray of vanilla CandiQuik candy coating. Dip Fruity Pebbles Pops into the CandiQuik and place on waxed paper to harden. 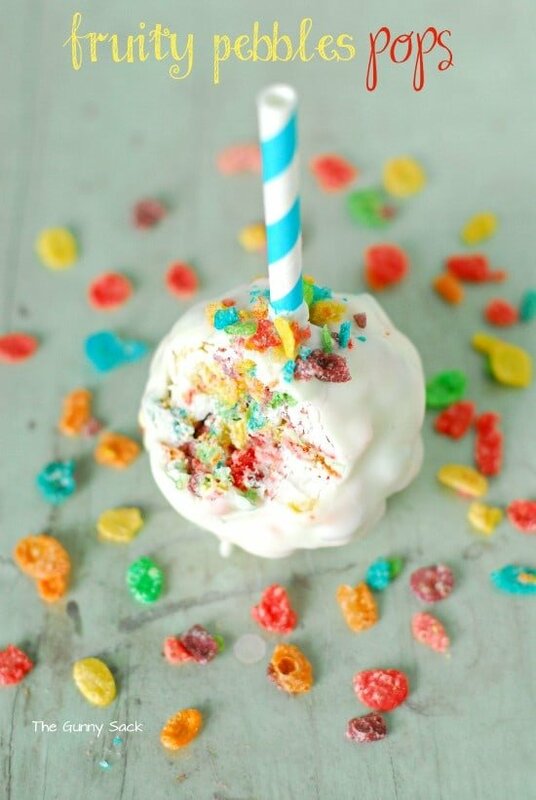 Sprinkle top with crushed Fruity Pebbles to add a pop of color. Allow the candy coating to harden and then enjoy! Melt more CandiQuik, as needed. Disclosure: Although I did not receive monetary compensation, the CandiQuik was sent to me by Log House Foods as a gift. you had me at fruity pebbles! I am so making these for the kids soon! Thanks for the brilliant recipe! What a fun treat!! I love the fun straw you used too! I’ll have to bring these to the next party we go to! Super cute! This would be so fun for a classroom treat! My kids would go crazy over these! So cute and fun! Aren’t these delicious?! I think I ended up eating about half the batch when all was said and done – haha. They can be kinda super-sweet but there’s something that doesn’t stop me from piling them into my mouth! Thanks for sharing 🙂 love your version! Thanks Sarah! I hear ya! My friend just sent me a text message with a photo saying look what we just had to make because of your blog! 🙂 Her kids are some of my biggest fans! Those are so colorful and so much fun! I love how they turned out! 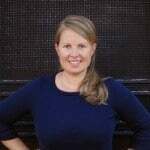 And your pictures are amazing Tonia! These are such a fun treat for kids…and adults 🙂 I love that they are on straws and dipped in chocolate! How fun, Tonia! My kiddos would go crazy over these!! Thanks Liz! So true but what is funny is that when I make the Fruity Pebbles Bars the adults go crazy for them too! These are DARLING!!! What a great idea! My kids would flip for these! Thanks Jen! Make them as a special, back-to-school treat! I loooooove Fruity Pebbles!! These are so pretty! Thanks Dorothy! They even smell delicious, don’t they? These are so much fun!!! This is so fun! I bet is was fruitilicious! Oh yeah! Even the adults loved them!